Screen recorders have become almost mainstream with so many people sharing their thoughts and screencasts on the Internet. Which may explain why we're looking at two this month – Green Recorder 3.0 on the next page and this, Open Broadcaster Software (OBS) Studio 20. OBS Studio has considerably more ambitions than simply turning your mouse wiggling into a file, as its name implies, and consequently does far more than simply stream your screen to the Internet. 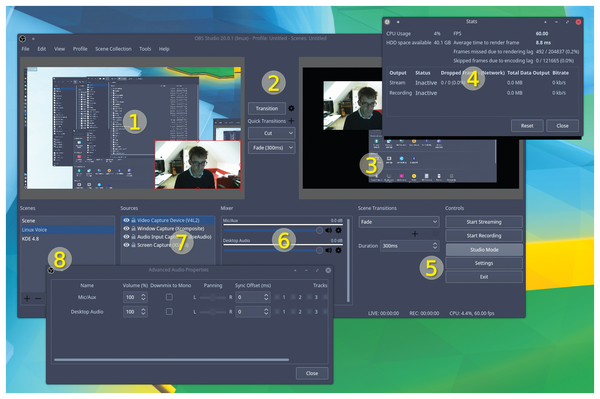 Alongside being completely cross-platform, it offers the kind of functionality you're more likely to find in a nonlinear video editor; you can capture, composite, edit, encode, and stream video content, directly from your Linux desktop. When the application starts, the size of your canvas can be different from the size of your screen. The canvas size is important because you can add lots of different sources to this canvas, all with their own resolutions, and the final output will always be scaled to your overall canvas resolution. You can even set a different base and output resolution for the canvas, effectively oversampling your output for higher quality, which is an excellent option if you have the system to handle it. The background organization of a recording or stream is mirrored in the application window layout, especially in the lower panes. Sources, in the bottom left, are the containers for each recording setup, just like presets, allowing you to switch between them easily and save configurations for how you want to use the application. This involves a set of sources, which are listed in the pane to the right. This Sources pane can behave like a clip manager in a video editor, containing image, text, and video files – but, crucially, sources can also be real-time inputs. You can choose different audio inputs and outputs, for example, alongside different video inputs and output, and not just video capture devices – a window or entire screen can be used as an input source, alongside images for overlays and text. In this way you could create a webcam overlay of yourself alongside the screencast, for instance. As with Gimp, these elements are layered, so you'd put the webcam source at the top if you wanted this to sit over a window capture. As you add sources, they appear in the preview window above, where you can rearrange them and resize them for the capture or stream. However, the real standout feature in OBS Studio is Studio Mode. With this enabled, you can transition between one scene and another, broadcasting or only recording the scene on the right of the window. This is brilliant in live situations as it allows you to line up sections in one scene while performing in the other, switching over seamlessly when ready – exactly as you might in a television studio, and it takes open source screen casting to a whole new level of capability. 1 Preview. In Studio Mode, the left panel allows you to build a scene with a real-time preview. 2 Transition. Change the way a recording or stream shows the scene transition. 3 Broadcast view. Work live and on a hidden scene at the same time. 4 Monitoring. Alongside a huge range of transcoding options, there's decent system performance monitoring. 5 Studio Mode. Switch between normal capture and streaming, or Studio Mode with transitions. 6 Monitoring. See audio input as it's captured. 7 Sources. Create a scene from lots of different audio, video, and image sources. 8 Scenes. Save all inputs as a scene for quick retrieval.